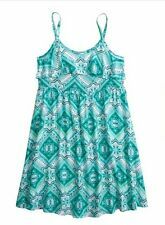 Justice Printed Flounce Dress Girls clothes Size 14 NWT!! Free Shipping! Choker - It's all in the details with this gorgeous jewel embellished lace choker. Featuring an adjustable chain for any desired length and soft fabric for comfort. // L: 9.5" 3.2" extension W: 1.4" //. AQUA COLOR. ALSO HAS A HAIR CLIP. PARTY DRESS. ELASTIC GATHERED ACROSS BACK FOR. (100% POSITIVE). FULLY LINED. GATHERED SKIRT. Zara Kids Girls Button Front Dress Size 13-14 NWT. Condition is New with tags. Shipped with USPS First Class Package. Zara Kids Girls Dress Size 13-14 NWT. Condition is New with tags. Shipped with USPS First Class Package. NWT Joyfolie Margueritte Dress. This beautiful dress features layers and layers of gorgeous ruffles, your fashionista will surely feel like a princess in this piece! Bodice: 60% cotton, 40% polyester. Skirt: 100% cotton. Length: 32" from shoulder seam to bottom hem. 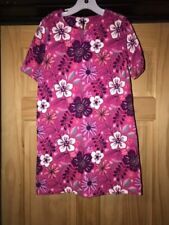 NWT Joyfolie Terra Dress. This beautiful boho-inspired dress features a ruffle high low hem and a dreamy cloud wash. The comfort of this breezy cotton gauze dress will make this dress her favorite. This is for the dress only.